I've started a dozen posts this past fortnight and found myself too easily distracted to finish even one. Mostly by the garden and the glorious autumn weather we've been enjoying. I'm going to publish this one. It's taken us a few weeks to get used to the new rhythm of school and associated going-ons. Even though we minimise after school activities, I still find myself struggling trying to remember if it is library, piano or soccer, despite having a very nice Frankie calendar on my wall. Problem solved by a trip the local second hand store, where I picked up on old cream cupboard door for $5 and gave it a lick of chalkboard paint. It sits by the door so I can remember to which day grab sheet music, violin, soccer boots or home readers on the way out. That's activities sorted, now I just have to make sure I can find the chalk. 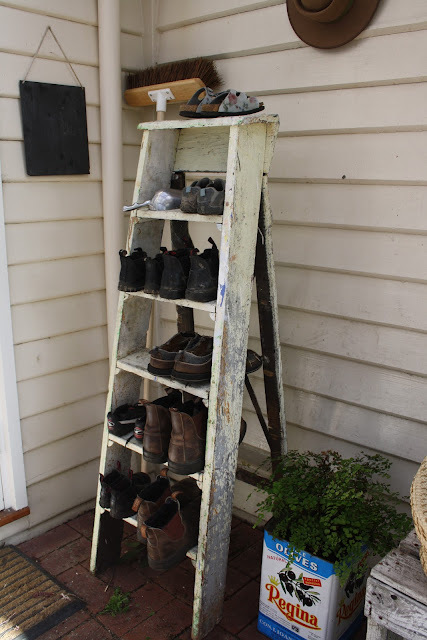 On the same visit, I picked up a nice old paint splattered step ladder which makes a very fine shoe rack. Now we can get out the door without falling over a pile of shoes. That's shoes sorted, now we just have to make sure we don't trip over Mabel, who likes to lie on the door mat in the sun. 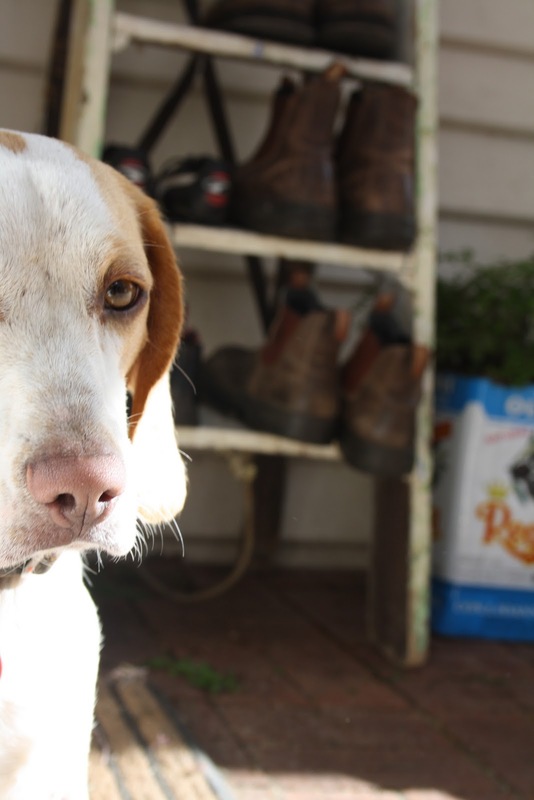 Speaking of handsome beagles, you must keep an eye out for the next issue of a stylish country magazine, where a certain pup may just grace the cover. Next up getting weeds sorted, getting the chooks sorted and getting the washing sorted. Righto, back to it. Love the shoe rack idea! Oh now that's exciting re front cover!! Can't wait to see it. Rob and I are seriously addicted to your salted choc chip biscuits. We were quite restrained and managed to save them until we got home! He did wonder if it was too cheeky to request the recipe, I'm not sure, if we know how to make them we'll eat them every day! Oh I do love the chalkboard and ladder. Very clever and beautiful. 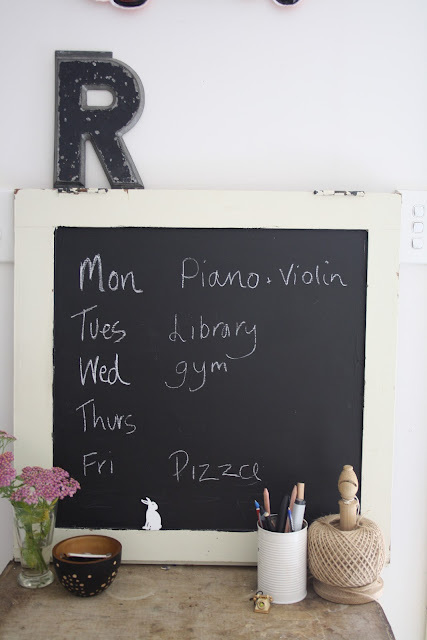 I like the blackboard cupboard door, looks great. I too made a trip to the hardware on the weekend for a large sheet of MDF for a blackboard for our dining space. We are trying to be more organised. I still think I ought to do an entire wall like we used to have at our old place. Gotta go google those salted choc chip cookies. I recently bought a magnetic white board, which i use to write up Italian words for me to learn! Your house is always such an inspiration.You have a great style happening there. I'm the same with trying to keep up with the weekly kids activities. Oh how sweet is Mabel! Love the ladder idea too. love your new additions. and Country Style! Wow. Will your whole house be featured? This ladder idea is fanstastic! Saw your article and loved it... all looks so beautiful. Such a handsome beagle.